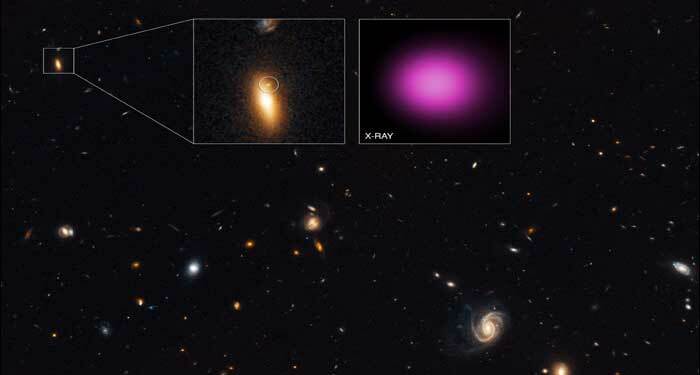 A strange object that astronomers think is a wandering black hole that came from a small galaxy falling into a larger one was discovered using NASA’s Chandra X-ray Observatory and ESA’s XMM-Newton X-ray observatory. The new study reports the discovery of one of these extremely luminous “wandering” black holes toward the edge of the lenticular galaxy GJ1417+52, which is located about 4.5 billion light years from Earth. Astronomers think that supermassive black holes, with some 100,000 to 10 billion times the sun’s mass, are in the centers of most galaxies. There is also evidence for the existence of so-called intermediate mass black holes, which have lower masses ranging between about 100 and 100,000 times that of the sun. This object, referred to as XJ1417+52, was discovered during long observations of a special region, the so-called Extended Groth Strip, with XMM-Newton and Chandra data obtained between 2000 and 2002. Its extreme brightness makes it likely that it is a black hole with a mass estimated to be about 100,000 times that of the sun, assuming that the radiation force on surrounding matter equals the gravitational force. The main panel of this graphic has a wide-field, optical light image from the Hubble Space Telescope. The black hole and its host galaxy are located within the box in the upper left. The inset on the left contains Hubble’s close-up view of GJ1417+52. Within this inset the circle shows a point-like source on the northern outskirts of the galaxy that may be associated with XJ1417+52. The inset on the right is Chandra’s X-ray image of XJ1417+52 in purple, covering the same region as the Hubble close-up. This is a point source, with no evidence seen for extended X-ray emission. The Chandra and XMM-Newton observations show the X-ray output of XJ1417+52 is so high that astronomers classify this object as a “hyper-luminous X-ray source” (HLX). These are objects that are 10,000 to 100,000 times more luminous in X-rays than stellar black holes, and 10 to 100 times more powerful than ultraluminous X-ray sources, or ULXs. The location and brightness of the optical source in the Hubble image that may be associated with XJ1417+52 suggest that the black hole could have originally belonged to a small galaxy that plowed into the larger GJ1417+52 galaxy, stripping away most of the galaxy’s stars but leaving behind the black hole and its surrounding stars at the center of the small galaxy. If this idea is correct the surrounding stars are what is seen in the Hubble image. The Daily Galaxy via NASA's Chandra X-ray Observatory. NASA: Europa's Water Plumes Detected –"Future Missions Able to Probe Its Ocean For Life on the Surface"
Hubble Captures Mysterious Rebirth of a Star –"The 1st Ever Observed"